Our one on one lessons for infants teach the student to rotate from a face down position to their back and float. Once they have mastered rotating to their back and maintaining a survival float, they will be required to attend lessons diapered and clothed. Toddlers and older students are taught to propel with their face in the water, rotate to their back to float for rest and air then to rotate back to their stomach to continue to propel. This sequence can be repeated as needed. Each student will complete lessons in clothing once the skills are acquired. Once younger students have survival skills, they can join our group lessons. For more information please refer to the Programs page. Parents interested in lessons are welcome to observe lessons prior to registering for any aquatic program; references available upon request. All lessons are offered Monday through Thursday. Private Lessons: Basic survival instruction from 6 months and 36 months for typical children. We offer lessons to Children with Challenges for all ages.. The basic survival lessons teach an infant the ability to rotate from a face-down position to an aquatic survival float. Once the survival float is mastered, the student will also attend lessons diapered and fully clothed. Toddlers and older students are taught to hold their breath, then to propel in the water, rotate from a face down position to their back to get air and rest, then return to a face down position to continue propulsion. This sequence can be continued as needed. Once mastered, students will also attend lessons fully clothed. Lessons are one-on-one conducted daily, Monday through Thursday only. It typically takes 4 to 6 weeks for the survival skills to be acquired. Lesson fees are $80 per week with a $50 per child registration fee. We have a continuous enrollment. We guarantee that your child will be done in 6 weeks, providing that their are not multiple absences or health related issues. Should your child attend all scheduled lessons and not complete the Basic Survival Program within the 6 weeks, you will not be charged for lessons exceeding that time frame. Aquababies: Once a student has successfully completed a “swim float swim” program, this program offers weekly lessons that provide the opportunity for a parent to get in the pool with their child to maintain their skills. Class: 3 to 4 participants per class, ages 7 to 30 months, 8 weeks at $20/wk. This class does require a parent or caregiver to participate inwater. Fun Days: Once a child has successfully completed a “swim float swim” program, this program provides weekly lessons that provide the opportunity for your child to maintain their skills and interact with other children of similar age. Class: 3 to 4 participants per class, ages 31 months to 4 years, 8 weeks at $20/wk. Strokes’n’Floats: Once a child has successfully completed a “swim float swim” program, Strokes’n’Floats offers weekly lessons that provide the opportunity for your child to work in a group setting learning basic stroke skills. Class: 3 to 4 participants, depends on child’s skills, 8 weeks at $20/wk. Stroke Work: Once your child is aquatically competent, weekly lessons are offered build up the fundamental strokes of: freestyle, butterfly, backstroke and breast stroke. Class: 3 to 4 participants, prior survival experience or testing, 8 weeks at $20/wk. Presentations: Swim with Becky & Friends is also available for Water Safety Presentations and other community engagements. Please contact us for additional information. Contact Miss Becky to sign up today! 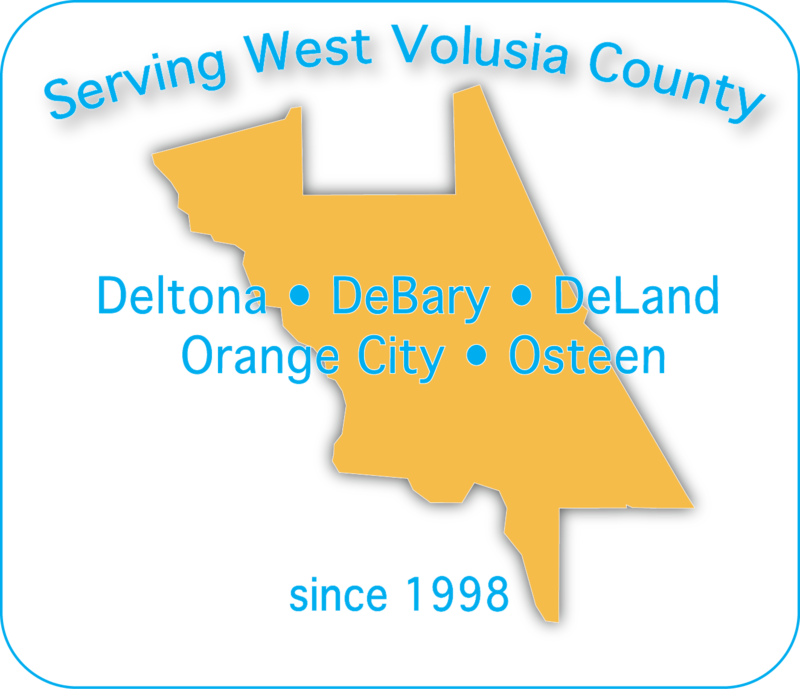 We are offering lessons in Orange City and Deltona. Please specific which location. After only THREE lessons, my 4-yr old gained the confidence to swim and was clamoring to see Miss Becky again. I am thrilled!!! Currently Miss Becky is the only instructor, therefore, we primary teach from ages 6 to 36 months for typical children and children with diagnosed disabilities of any age. hello I wanted to know is it to late to teach my children to swim if they are 5 years old and 3 year old twins?